Check out our advocacy in action around stock epinephrine programs on campuses. Participate in research, there are two important research studies open right now. Plus, read about the latest in research, including potential new emergency treatments for anaphylaxis, the effectiveness of continued dosing after multi-food oral immunotherapy, and more. 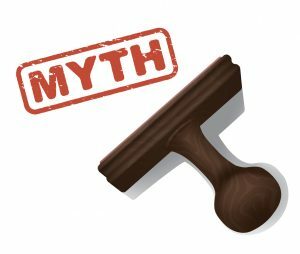 And, be sure to check out this month’s mythbuster on cross-contamination! Last year, as a part of our advocacy to ensure post-secondary campuses become more allergy-aware, we launched “Managing Food Allergies and Anaphylaxis: A Guide for Post-Secondary Institutions”. 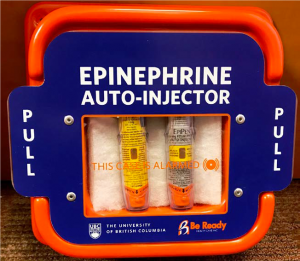 Since that time, over 55% of universities have downloaded the guide and some institutions have also now implemented a stock epinephrine (“stock epi”) program. A stock epi device is an epinephrine auto-injector (e.g. EpiPen®/AUVI-Q®) that is not prescribed to a specific person and can be used in an emergency. Our guide contains key recommendations on stock epi, including how to manage the onsite devices. The University of Victoria launched a stock epi program last year after learning more about what the program would entail through our earlier stock epi in public settings webinar. And, more recently the guide has helped to inspire the University of British Columbia and University of New Brunswick to also start their own stock epi programs. Learn more about having stock epinephrine in public settings in our webinar below. Having stock epi programs on campuses is a positive step forward in supporting students and staff who have food allergies and are at risk for anaphylaxis. Help your campus become more allergy aware! If you or your child is attending university or college, check out our post-secondary section at foodallergycanada.ca/campusguide, and please share the guide with your institution. Participate in a new study that aims to understand your health preferences and how food allergy affects your quality of life. This study is a collaborative initiative with CHU-Sainte Justine’s in Montreal and Food Allergy Canada, and is sponsored by a Canadian Allergy, Asthma and Immunology Foundation research grant. 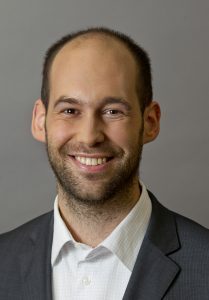 It is led by Dr. Philippe Bégin, allergist at CHU Sainte-Justine. If you have a food allergy or are a parent of a child with food allergy, you’re invited to participate in this important study. You will be asked to complete an online survey, available in English and French, that should take approximately 40 minutes to complete. 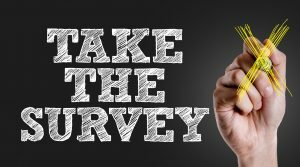 This survey is lengthy because it includes detailed questions on your general health preferences, which are needed to establish quality of life indicators for the food allergy population. These measurements have never been calculated before. Your participation in the study is vital to providing the researchers, and patient organizations like ours, with insightful results on how the quality of your life can be greatly improved. 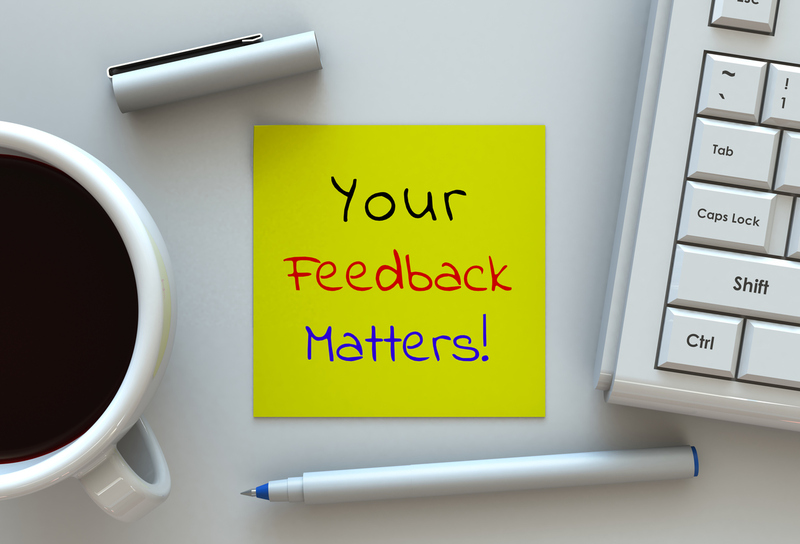 Your participation is crucial to providing the researchers with meaningful results. Please take the time to complete the survey. Note: the survey will not work on mobile phones. For any questions or comments on this research, please contact the research team at 514-345-4931, extension 4201 or at info.allergie.hsj@ssss.gouv.qc.ca. For any questions regarding your rights as a participant in this research project or if you have any complaints or general comments, please contact the CHU Sainte-Justine ombudsman at 514-345-4749. If you are a university student with food allergies attending McGill University, McMaster University, Queen’s University or the University of British Columbia, you are invited to participate in a research study looking at the experiences of university students with food allergies. Please complete a short, online survey. It should take up to 10 minutes to complete. Survey findings will help researchers, and patient organizations like ours, better understand how students with food allergies are supported on campuses. All data collected will remain anonymous. If you have any general questions about the study, please contact Ernie Avilla, Research Coordinator, McMaster University, Canada at avillae@mcmaster.ca or call 289-921-8716. Share, share, and share! Please spread the word and share with students with food allergies attending these institutions. Klaria Pharma and Purdue Pharma recently announced an exclusive agreement to co-develop KL-01401, which is an epinephrine oromucosal film, for the treatment of anaphylaxis. KL-01401 is based on Klaria’s novel patented drug delivery platform, which provides several benefits to patients. It is planned as an easy to use, non-injectable self-administered treatment that allows patients and their caregivers to discreetly carry a life-saving emergency treatment medication with them at all times. A study by researchers in the Stanford lab of Stephen Quake are using single cell RNA sequencing to better understand food allergies and the antibodies that cause them. The study concentrates on the role of Immunoglobulin E (IgE) antibodies, which play a central role in immune responses, and causes allergic reactions. From the early results, Stanford researchers say there is a potential to develop a therapeutic to treat food allergies from their lab’s research. 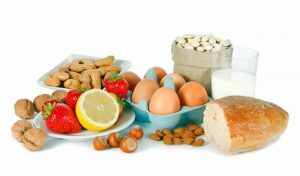 These findings ultimately can provide better insight on diagnosing and treating food allergies. A recent study was conducted to investigate the effectiveness of successful desensitization with sustained dosing versus discontinued dosing after completing multifood-oral immunotherapy (multifood-OIT). This research helps to better understand the sustainability of desensitization of multifood-OIT. OIT refers to a medical protocol where a patient consumes small amounts of a food they are allergic to, such as peanut, in a controlled environment (allergy clinic/hospital). Over a prolonged period of time the dose (amount of the allergen) is gradually increased. The goal of OIT is to induce “desensitization”, where the person can eat more of the food without having an allergic reaction than they were able to prior to OIT. The results of this study suggest that sustained desensitization best occurs through continued maintenance OIT dosing as opposed to discontinuation of multi-OIT. 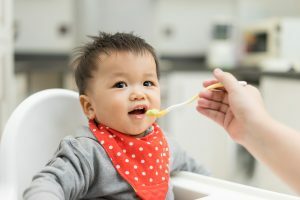 Gut bacteria may play a role in protecting against food allergy in infants, according to a study published in Nature Medicine. The study found that intestinal bacteria is critical for regulating allergic responses and suggest that interventions that control bacterial communities may be therapeutically relevant for food allergy. These findings pave the way for innovative interventions for the prevention and treatment of food allergy. FACT: Yes. Food allergens can be passed on through saliva from people (e.g. biting into/sharing an apple) and pets. Anything that goes into the mouth could be a possible source of cross-contamination. Although small amounts of allergens may not be visible, an allergic reaction can still occur. Learn about the different types of cross contamination. Bonus: Check out our video on understanding the basics on cross-contamination. Help us educate your communities and share this Mythbuster with them! Stay tuned for more Mythbusters to come.